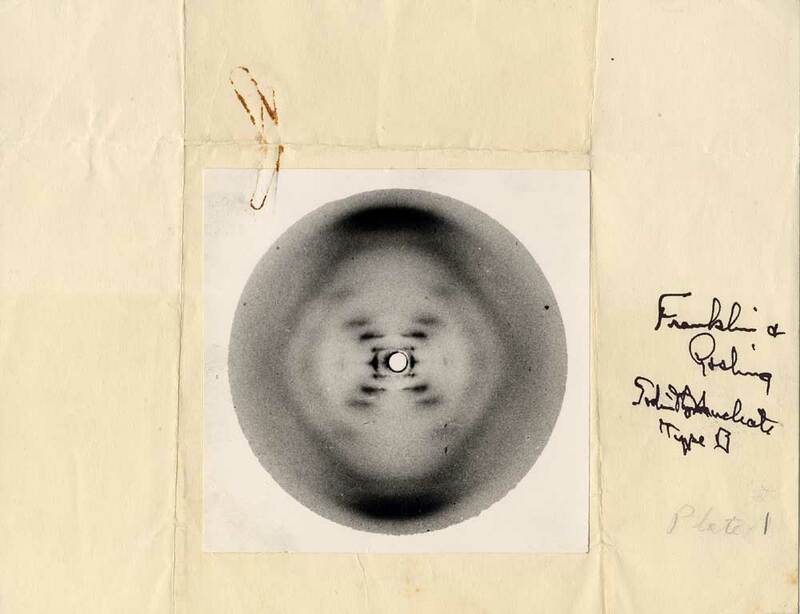 It was the work of Rosalind Franklin, her pictures of the structure of the DNA, the dubble helix, that revealed the puzzle to James Watson. Yet, he took credit for it. “Compared with all previous B patterns that Franklin had obtained, these two pictures were vivid, No. 51 especially so. The overall pattern was a huge blurry diamond. The top and bottom points of the diamond were capped by heavily exposed, dark arcs. From the bull’s-eye, a striking arrangement of short, horizontal smears stepped out along the diagonals in the shape of an X or a maltese cross. The pattern shouted helix. Wat beteken dit vir ons gewonde sterflinge, wat het Rosalind ontdek? Sy het die kristallografiese foto’s geneem van DNS (in die vroeë vyftigs) wat uiteindelik daartoe gelei het dat ons weet hoe lyk DNS (‘n dubble heliks). Maar sonder wat sy bewus was daarvan het ‘n medenavorser haar foto’s gevat en vir iemand anders gewys. Hy het toe die deurbraak gemaak en die grootliks die eer gevat. Na my mening is dit steel van iemand anders se navorsingmateriaal. Daarna het die drie mans op die span neerhalende opmerkings oor haar gemaak. Sy is op 37 aan kanker dood, juis oor die hoë-stralingsmateriaal waarmee sy gewerk het. Sou die struktuur van DNS bepaal geword het sonder haar? Seker ja, maar veel later en die drie mans sou dalk nie weggestap het met die Nobelprys nie. Sodium deoxyribose nucleate from calf thymus, Structure B, Photo 51, taken by Rosalind E. Franklin. “Source: Special collections, The Valley Library, Oregon State University. This, is just and introduction about who Rosalind was. The blog is under construction and articles on genetics, astronomy, paleontology, evolution, antropology and archeology will soon follow. Rosalind Franklin always liked facts. She was logical and precise, and impatient with things that were otherwise. She decided to become a scientist when she was 15. She passed the examination for admission to Cambridge University in 1938, and it sparked a family crisis. Although her family was well-to-do and had a tradition of public service and philanthropy, her father disapproved of university education for women. He refused to pay. An aunt stepped in and said Franklin should go to school, and she would pay for it. Franklin’s mother also took her side until her father finally gave in. War broke out in Europe in 1939 and Franklin stayed at Cambridge. She graduated in 1941 and started work on her doctorate. Her work focused on a wartime problem: the nature of coal and charcoal and how to use them most efficiently. She published five papers on the subject before she was 26 years old. Her work is still quoted today, and helped launch the field of high-strength carbon fibers. At 26, Franklin had her PhD and the war was just over. She began working in x-ray diffraction — using x-rays to create images of crystalized solids. She pioneered the use of this method in analyzing complex, unorganized matter such as large biological molecules, and not just single crystals. She spent three years in France, enjoying the work atmosphere, the freedoms of peacetime, the French food and culture. But in 1950, she realized that if she wanted to make a scientific career in England, she had to go back. She was invited to King’s College in London to join a team of scientists studying living cells. The leader of the team assigned her to work on DNA with a graduate student. Franklin’s assumption was that it was her own project. The laboratory’s second-in-command, Maurice Wilkins, was on vacation at the time, and when he returned, their relationship was muddled. He assumed she was to assist his work; she assumed she’d be the only one working on DNA. They had powerful personality differences as well: Franklin direct, quick, decisive, and Wilkins shy, speculative, and passive. This would play a role in the coming years as the race unfolded to find the structure of DNA. Franklin made marked advances in x-ray diffraction techniques with DNA. She adjusted her equipment to produce an extremely fine beam of x-rays. She extracted finer DNA fibers than ever before and arranged them in parallel bundles. And she studied the fibers’ reactions to humid conditions. All of these allowed her to discover crucial keys to DNA’s structure. Wilkins shared her data, without her knowledge, with James Watson and Francis Crick, at Cambridge University, and they pulled ahead in the race, ultimately publishing the proposed structure of DNA in March, 1953. The strained relationship with Wilkins and other aspects of King’s College (the women scientists were not allowed to eat lunch in the common room where the men did, for example) led Franklin to seek another position. She headed her own research group at Birkbeck College in London. But the head of King’s let her go on the condition she would not work on DNA. Franklin returned to her studies of coal and also wrapped up her DNA work. She turned her attention to viruses, publishing 17 papers in five years. Her group’s findings laid the foundation for structural virology. While on a professional visit to the United States, Franklin had episodes of pain that she soon learned were ovarian cancer. She continued working over the next two years, through three operations and experimental chemotherapy and a 10-month remission. She worked up until a few weeks before her death in 1958 at age 37.